Let’s just call this “Sriracha and Garlic Toast Week” around here, ok? Did you see my Sriracha Garlic Toasts with Shrimp earlier this week? There’s just something about this combination of flavors and textures that gets to me. 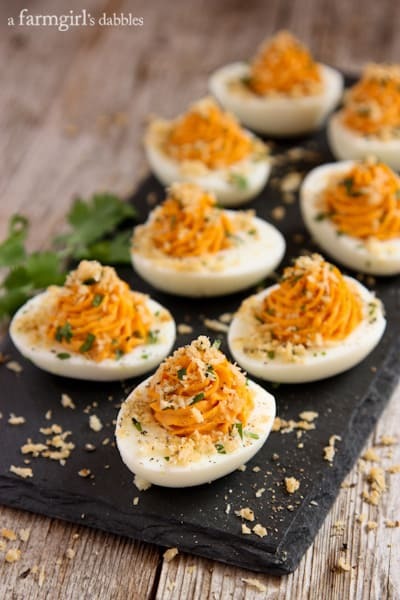 I almost topped these Sriracha Deviled Eggs with Garlic Toast Crumb Topping with a small grilled shrimp, too, because I think shrimp is killer with sriracha. What’s your vote on the addition of shrimp? Yay or Nay?! Deviled eggs make me happy. Creamy, tangy, and presented adorably in their own hard-boiled packaging, I find them utterly hard to resist. If left to graze freely, I could put a pretty big dent in a dozen eggs, no problem. Eggs are the perfect backdrop for so many flavors, and lately sriracha is at the top of my list. This Asian hot sauce adds incredible flavor to fried eggs, scrambled eggs, and let us not forget deviled egg filling. 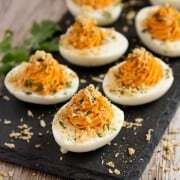 For these deviled eggs, the filling consists of a super simple mixture of egg yolks, plus mayo and sriracha. Nothing else is needed as the sriracha already has so much flavor. 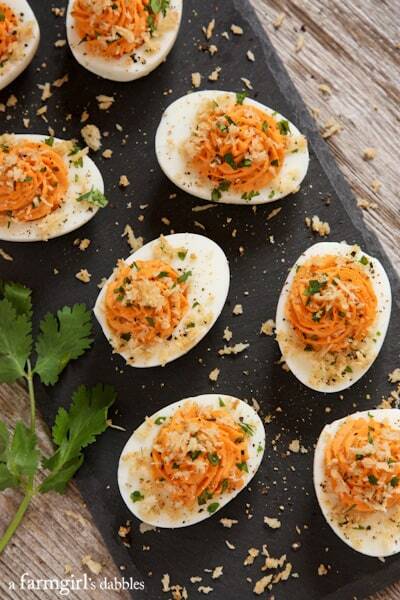 You could honestly stop right there and have a fabulous tray of deviled eggs. You could take it to the next level and create an easy little crispy buttery garlic bread crumb topping and sprinkle it over the sriracha filling. 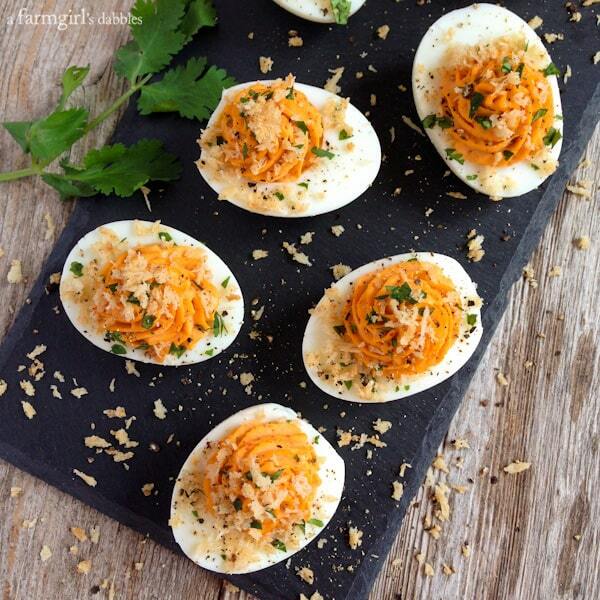 Those crunchy little bits contrast gorgeously with the creamy filling. Just try it. I promise you, you’re in for a treat! Crack and peel each egg and then slice them in half. Place the yolks in a medium mixing bowl along with the mayo and sriracha. Blend well with a fork if you plan to spoon the filling into the egg whites. If planning to use a pastry bag and star tip to fill the egg whites, it works best to use a blender to get the filling as smooth as possible. In a pan over medium to medium-high heat, melt the butter. Add panko, garlic powder, and salt. Stir to combine. Saute until bread crumbs are fragrant and lightly browned. Remove garlic toast crumb topping to plate to cool. While bread crumbs are cooling, fill egg whites with sriracha filling using either a spoon or a pastry bag fitted with a star tip. Top with a sprinkling of garlic toast crumb topping, black pepper, and cilantro. Serve immediately. 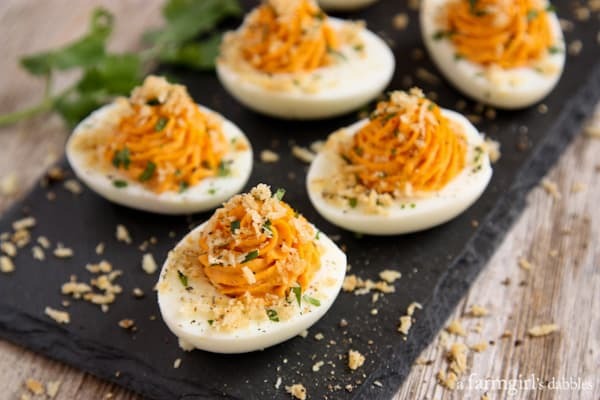 These can be prepared many hours before serving, but don’t add the garlic toast crumb topping until right before serving, to prevent the topping from getting soggy.